Patrick Henry was a successful lawyer and politician from Virginia. He went onto become Governor of that state, as well as a Founding Father. As an extensive landowner, and as most Founding Fathers, Henry owned a number of slaves throughout his life. The number of slaves that Henry owned has been recorded at about 80. However, he would go on to become aware of the wrongdoings within slavery and push for its abolishment. Henry’s dissent towards slavery can be seen in numerous documents throughout his life including letters to colleagues. One of the most relevant of these documents includes Henry’s January 18, 1773 letter to Robert Pleasants, an abolitionist from Henrico County, Virginia. 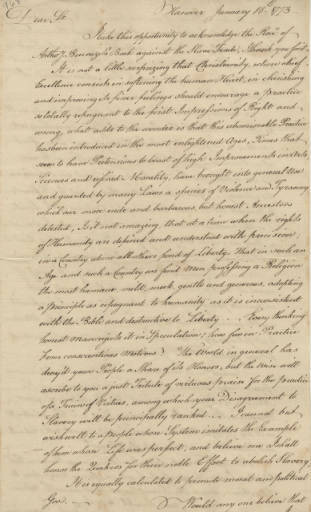 Within this letter, Henry first thanks Pleasants upon receiving a slave, and then continues to discuss a number of disagreements towards the idea of slavery. He speaks on Christianity and the fact that it “consists in softening the human heart” however it allows “a practice so totally repugnant.” Henry goes on to say that it is hard to believe that during a time of enlightenment and emphasis on human rights, that the practice of slavery could continue. 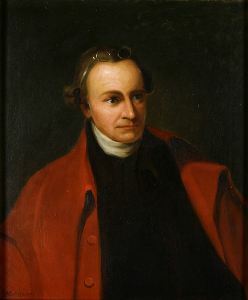 Patrick Henry was a religious man, which often showed throughout his role as one that was opposed to slavery. Although he is famously quoted stating that, he was “drawn along by the general inconvenience of living here without them. I will not, I cannot justify it,” his slaves were treated slightly different than the average. Henry’s slaves were often taught to read the Bible. They were also taught other specific trades such as carpentry, distilling whiskey, tanning leather or blacksmithing. There is no doubt that Patrick Henry was revolutionary in the area of the abolishment of slavery. He was outspoken, knowledgeable and progressive within the practice that he resented. Although he often advocated for abolishment, treated his slaves differently and rallied support for his ideas, he was under scrutiny by some. This was because he himself had never released his slaves, even upon his death. This decision had much to do with the idea of controlling the slave population rather than the push for abolition. Henry was a man of revolution and his views on slavery were those of dissent. He was one of the leading participants in ending the slave trade between Africa and Virginia as well as an advocate for abolishment as a whole.